Planet Earth has been destroyed. 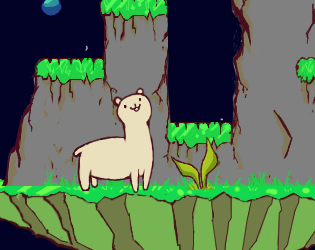 Only a small portion of land, with a little alpaca, remains in space. But the aliens have found it and now the mighty alpaca must defend the new planet! An arcade platformer shoot' em up. Eat the grass so you can spit it to the enemies.